Hong, A. W. and Guan, K. (2017). Non-radioactive LATS in vitro Kinase Assay. 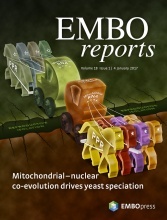 Bio-protocol 7(14): e2391. DOI: 10.21769/BioProtoc.2391. Large tumor suppressor 1/2 (LATS1/2) are protein kinases and core components of the Hippo pathway, which regulates organ size and tissue homeostasis. LATS kinase is activated by phosphorylation on its hydrophobic motif (HM, Thr 1079 for LATS1 and Thr 1041 for LATS2). As a result, Western blotting with phosphoantibody recognizing LATS at HM provides an indirect way to assess LATS kinase activity (Data analysis, Figure 1). In addition, active LATS phosphorylates and inhibits the transcription co-activator Yes-associated protein (YAP) at Ser 127, leading to YAP binding to 14-3-3 and cytoplasmic retention (Zhao et al., 2007). Using YAP as a substrate in LATS in vitro kinase assay provides a method to directly assess LATS kinase activity. 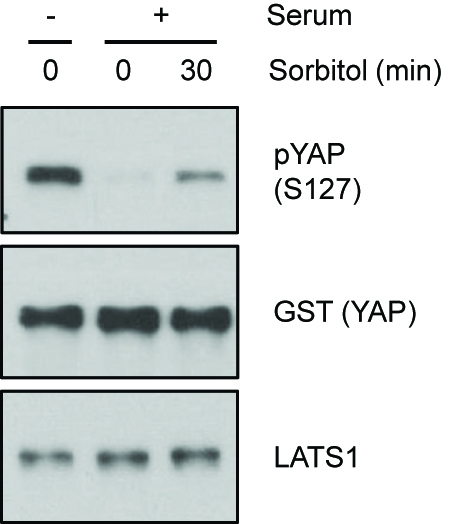 Through this assay, we were able to show that serum starvation and sorbitol-induced osmotic activate LATS (Yu et al., 2012; Hong et al., 2017) and further lead to YAP Ser 127 phosphorylation (Data analysis, Figure 2). Transform pGEX-KG-GST-YAP in BL21(DE3) competent cells by heat shock at 42 °C for 45 sec. Plate the cells on LB agar plates with 100 μg/ml carbenicillin and incubate overnight at 37 °C. Pick a single colony and inoculate in 5 ml LB broth with carbenicillin. Incubate overnight at 37 °C. Pour the 5 ml cultured bacteria in 500 ml LB broth and grow at 37 °C for around 2-3 h until OD600 = 0.6-0.8. Induce with 0.1-0.4 mM IPTG. Shake overnight at 16 °C. Spin down the bacteria at 4,000 x g for 15 min at 4 °C. Lyse the cells in 9 ml of PBS + 1x protease inhibitor + 1 mM PMSF + 1 mM DTT. Sonicate on ice. Total sonication time 1 min 30 sec, interval 15 sec. Amp = 30%. Add 1% Triton-X to the sonicated bacterial samples. Shake in 4 °C for 20-30 min. At the meantime, wash the glutathione Sepharose 4B beads 3 times with 0.1% Triton-X in PBS. 200 μl beads were used for 500 ml of bacteria culture. Spin down the bacteria at 10,000 x g for 30 min at 4 °C. Collect supernatant and add the beads. Rotate overnight at 4 °C. Centrifuge down the beads at 500 x g for 5 min at 4 °C. Wash with PBS + 0.1% Triton-X 3 times, 5 min each. Add 500 μl elution buffer and rotate for 1 h at 4 °C. Spin down the sample at 500 x g for 5 min at 4 °C. Collect the elution for dialysis against dialysis buffer at 4 °C twice. HEK293A cells are cultured in Dulbecco’s modified Eagle’s medium (DMEM) with 10% fetal bovine serum (FBS). Cells were seeded in 10 cm plates at a density of 1.5 x 106 per plate and were incubated in 37 °C, 5% CO2 until 80% confluent. A positive control can be cells that are serum starved for 30 min (Figure 2). Wash the cells with cold PBS. Remove PBS and scrape down the cells with 1 ml cold Mild lysis buffer (see Recipes) supplemented with 1x protease inhibitor, 1x phosphatase inhibitor, and 1 mM PMSF. Transfer the cells into 1.5 ml Eppendorf tubes. Incubate the samples on ice for 10 min. Spin down the lysates at 12,000 x g for 15 min at 4 °C. Collect the supernatants and incubate with 1 μl LATS1 antibody per sample overnight at 4 °C with constant rotation. Using a magnetic rack, wash the magnetic beads (10 μl per sample) 3 times with Mild lysis buffer. Resuspend the magnetic beads in 50 μl of Mild lysis buffer and add to the lysate. Rotate for 1 h at 4 °C. Using a magnetic rack, wash samples 3 times (10 min each) with 1 ml Mild lysis buffer per sample at 4 °C. Wash samples once with 1 ml 1x TBS (see Recipes) per sample for 10 min at 4 °C. While washing with TBS, prepare a master mix for the kinase reaction. Each kinase reaction contains 4 μl 10x kinase buffer, 500 μM cold ATP, and 1 μg GST-YAP in 40 μl reaction mix. Spin down the samples and remove the TBS using a magnetic rack. Add 40 μl of master mix into each reaction. Shake the reaction mixture at 30 °C for 30 min. Add 4x SDS sample buffer to stop the reaction, and heat the samples at 100 °C for 5 min. The samples are then subjected to SDS-PAGE and Western blotting. Sorbitol or serum starvation-induced LATS activity can be assayed by detecting the phosphorylation of LATS at HM (Figure 1). Direct kinase activity of LATS can be measured by detecting the phosphorylation level of YAP in LATS in vitro kinase assay (Figure 2). Increased YAP phosphorylation represents increased LATS kinase activity. Figure 1. 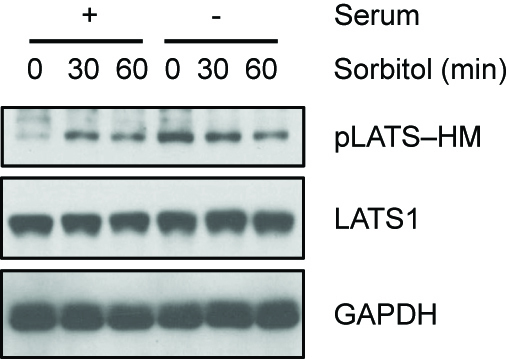 Serum starvation and sorbitol-induced osmotic stress induce LATS HM phosphorylation. HEK293A cells were treated with 0.2 M sorbitol for 30 or 60 min in the presence or absence of serum. LATS phosphorylation at the hydrophobic motif (HM) was detected with the phospho-specific pLATS antibody. (pLATS-HM Ab 1:1,000 dilution, LATS1 Ab 1:2,000 dilution, GAPDH Ab 1:2,000 dilution in 5% BSA containing TBST). Figure 2. Kinase activity measured by LATS in vitro kinase assay. HEK293A cells were serum starved or treated with 0.2 M sorbitol for 30 min. LATS1 was immunoprecipitated and an in vitro kinase assay was performed using recombinant GST-YAP as a substrate. Phosphorylation of YAP was determined by immunoblotting with a phospho-YAP (S127) antibody. (pYAP S127 Ab 1:1,000 dilution, GST Ab 1:2,000 dilution, LATS1 Ab 1:2,000 dilution in 5% BSA containing TBST). Note: Stored at room temperature. Hong, A. W., Meng, Z., Yuan, H. X., Plouffe, S. W., Moon, S., Kim, W., Jho, E. H. and Guan, K. L. (2017). Osmotic stress-induced phosphorylation by NLK at Ser128 activates YAP. EMBO Rep 18(1): 72-86. Yu, F. X., Zhao, B., Panupinthu, N., Jewell, J. L., Lian, I., Wang, L. H., Zhao, J., Yuan, H., Tumaneng, K., Li, H., Fu, X. D., Mills, G. B. and Guan, K. L. (2012). Regulation of the Hippo-YAP pathway by G-protein-coupled receptor signaling. Cell 150(4): 780-791. Zhao, B., Wei, X., Li, W., Udan, R. S., Yang, Q., Kim, J., Xie, J., Ikenoue, T., Yu, J., Li, L., Zheng, P., Ye, K., Chinnaiyan, A., Halder, G., Lai, Z. C. and Guan, K. L. (2007). Inactivation of YAP oncoprotein by the Hippo pathway is involved in cell contact inhibition and tissue growth control. Genes Dev 21(21): 2747-2761. How to cite: Hong, A. W. and Guan, K. (2017). Non-radioactive LATS in vitro Kinase Assay. Bio-protocol 7(14): e2391. DOI: 10.21769/BioProtoc.2391.